After four weeks of living in the Czech Republic, I have to admit my knowledge of Prague street food is still somewhat limited. Despite the fact that I’ve visited Prague a number of times and eaten street food on each occasion, my experience is mostly limited to different types of sausages. All of them tasted good and, in the case of the ones that were served in a bun, they were surprisingly large. 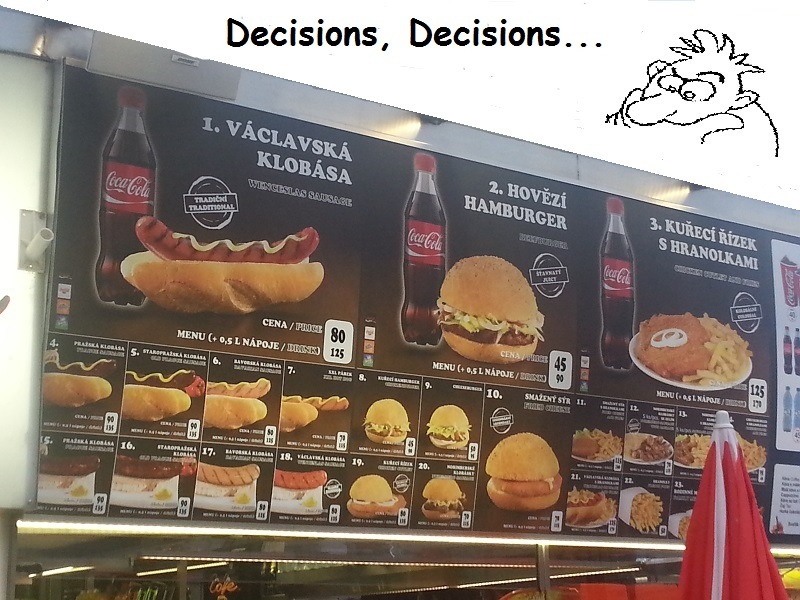 One of the things I noticed and found interesting was the sausages in Prague are not always served in a bun. Customers also have the option of having their sausages served on top of a slice of brown bread. I’ve never seen that before. 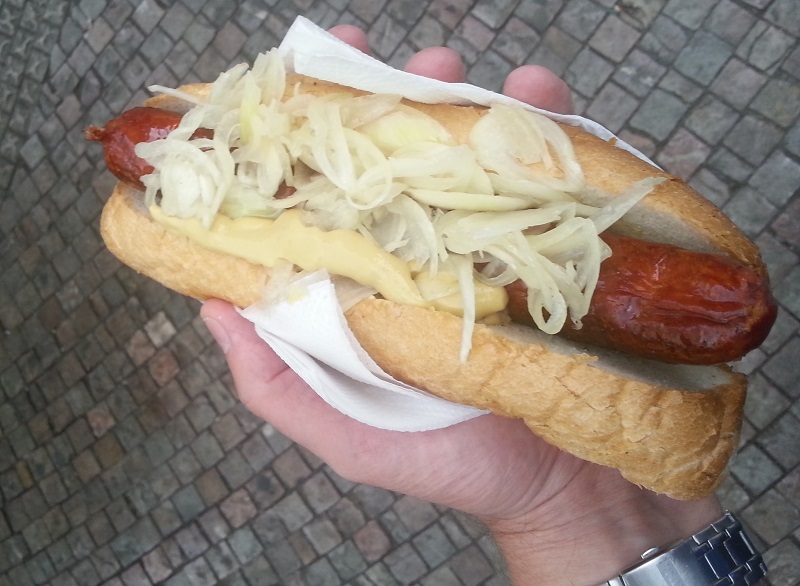 Although most of the people who buy Prague street food appear to be happy to eat their sausages with a little mustard or ketchup, onions and sauerkraut are available. In my experience, they seldom ask if you want either option but if you ask they are quick to tell you to help yourself. 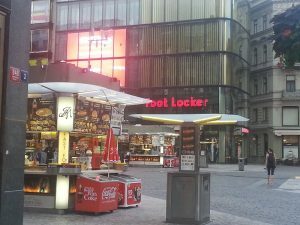 If you are visiting the city and hoping to try some warm Prague street food, there are a number there are several food stalls in Wenceslas Square. Many of them are clones. They are identical to look at and have the same items on the menu. Customers who wish to hang around and eat their food can stand at the stainless steel construction next to the stall that has a surface to eat from and a rubbish bin underneath. 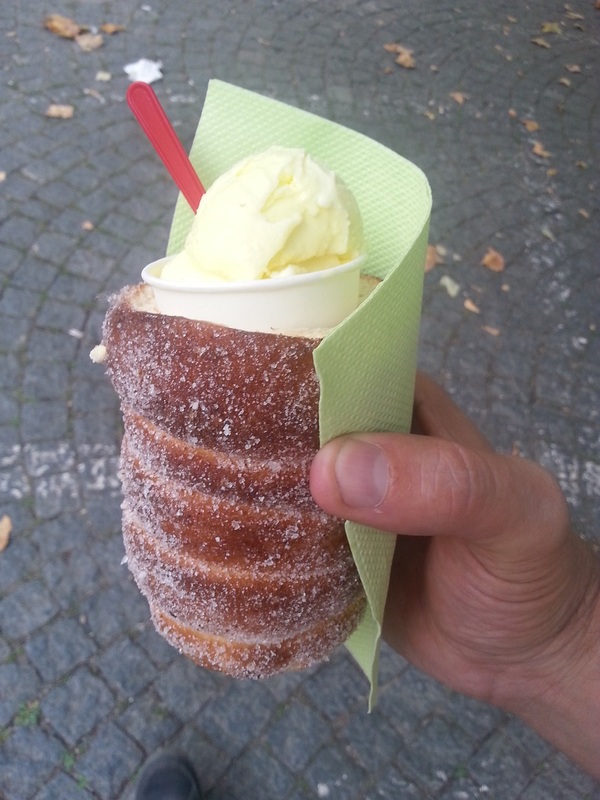 During the time I spent walking around the city, I never noticed any Prague street food stalls like the ones in Wenceslas Square, but I encountered several stalls selling trdelnik pastries—with or without ice cream. According to the street vendor who sold me the sausage, the difference between Prague sausage and Old Prague sausage is one of them is spicy and the other contains garlic. I opted for the garlic version and, if I remember correctly she said it was the Old Prague sausage. Nuremberg is in Germany, so the sausages used in this popular Prague street food appear to have made the trip over the border. The cabbage the sausages are served with is actually sauerkraut, but I found it tastes a little different to the sauerkraut I’ve eaten in the countries to the west of the Czech Republic. 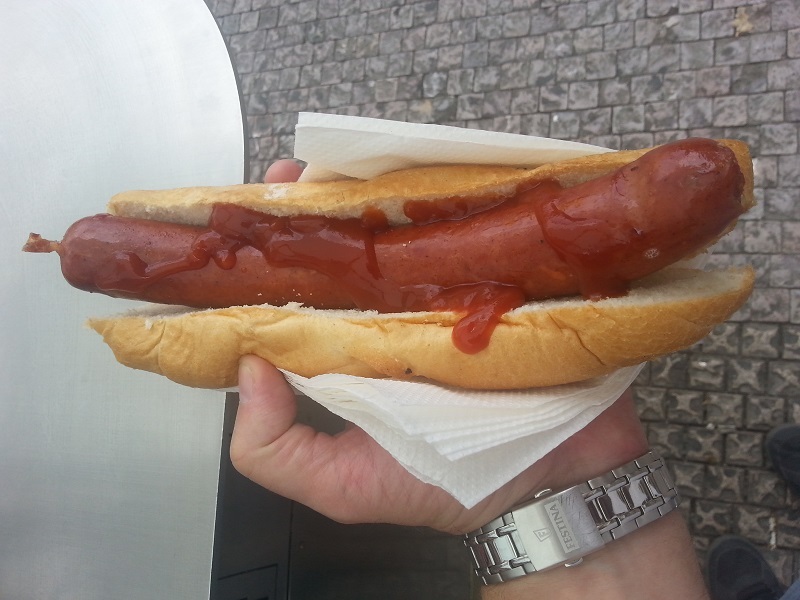 There is no way I could stand in Wenceslas Square and not try a Wenceslas sausage. Like the Prague sausage, it was pretty big. It tasted pretty good too, but I prefer the taste of the Old Prague sausage. Like the Nuremberg Sausages served with sauerkraut at the Prague fast food stalls, the Bavarian sausage appears to have made the trip over the border from Germany. It’s lighter in colour than the Prague Sausages and the Wenceslas sausage. 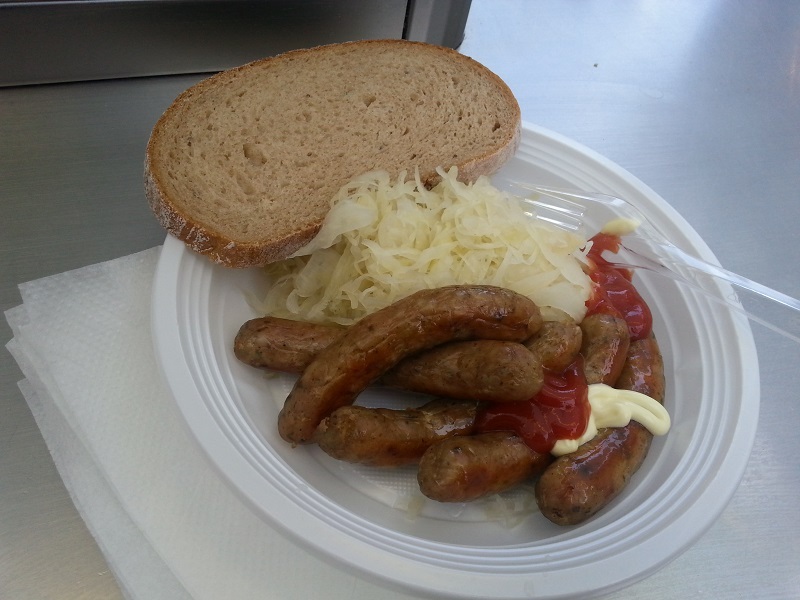 Personally, I like the Bavarian sausage better than the Wenceslas sausage, but it’s just a matter of personal taste. I noticed people eating trdelníks all over the city and saw a number of stalls selling them. I also noticed a lot of ice cream shops and cafeterias had them as well. Trdelníks are a pastry/dough that’s baked on a cylindrical spit. They are usually coated with sugar or cinnamon and, although you can buy them and eat them in this state, a lot of vendors sell them filled with ice cream. The one I bought had a plastic tub in the middle for the ice cream., but I saw lots of people eating trdelníks and ice cream. that appeared to have been served minus a tub. The girl at the stall told me Trdelníks are “traditional to Prague”. I’ve since learned they originated in the Hungarian speaking region of Transylvania. 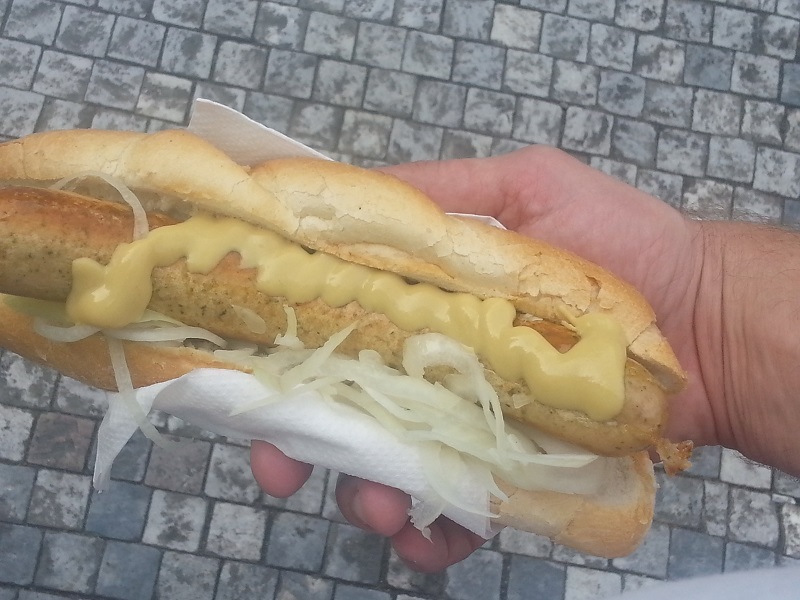 So trdelníks are another popular Prague street food that originated over the border.